We just watched every single one of our “kings” lose their crowns on The Street over the last few years, so I think I have that part covered. Let’s focus on the second lesson by going through a keeping it real exercise concerning the truth about the Dow breaking 10,000 yesterday. Speaking with clients yesterday, I got a ton of questions about why wasn’t I more excited about the Dow Jones Industrial Average breaking back above this psychologically significant level. I’m going to drastically oversimplify the reason for my lack of enthusiasm on purpose, because I think the broad strokes are all that really matter in this case. 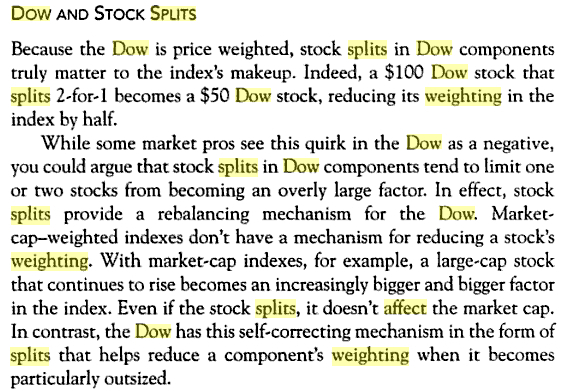 The Dow is a price-weighted average, in contrast with the S&P 500, which is market-cap weighted. In English, the higher a Dow component company’s share price, the more weighting it has in terms of calculating the index. The company’s market cap doesn’t matter for the Dow Jones like it does for the S&P. Thus, we get a situation in our current DJ Industrial Average where IBM, at a 9.86% weighting is 7 times more important to the index’s value than General Electric, which now has a mid-teens stock price and carries only a 1.27% weight (as in the chart above). At 128 dollars per share, IBM still has its dignity and now accounts for almost 10% of the average. So, if we boil this down to my as-promised oversimplification, only a handful of the Dow 30 stocks like IBM and the oil names like Exxon and Chevron have any manhood left in their stock prices. Thankfully, these companies didn’t too many stock splits, as splits would have caused rebalances that would’ve granted even more weight to our national embarrassments like GE, Bank of America and Pfizer – 3 stocks that have fallen and can’t get up. So yes, I’m underwhelmed and unimpressed by the Dow’s 10,000 point breach. I’ve seen it before, and the last time I did, this country was full of jobs, innovation, freedom, capitalism and energy. What are we “full of” this time? Rhymes with Quit. Full Disclosure: Nothing on this site should ever be construed as research, advice or an invitation to buy or sell any securities, please see my Terms & Conditions page for a full disclaimer.